The Mahlke Chronicles: A Birthday and a New Room, part 1. "Do not grow old, no matter how long you live. Never cease to stand like curious children before the great mystery in which we were born." Day by day, pieces of my baby fall away, morph into something new and different, or just disappear forever. Gone is his babyness, replaced by this older version of himself. Next year I'll lament the same thing, this passage of time. It never ceases. Just keeps on ticking away, taking precious pieces of my baby with it. It's hard to be completely sad about this loss since it's not so much a loss as it is a transformation. One day Spencer was a tiny baby with chicken legs screeching his shrill cry; and then slowly, gradually, over time he became this new Spencer, still as scrawny, but screeching a different sort of tune. My baby turned six. And with this birthday came the same sentimentality that creeps in with each passing year. Spencer as a newborn. Spencer as a toddler. Spencer as a threenager. Spencer as a preschooler. We are a month away from him entering a new stage of his life--kindergarten--and, for now, I'll soak in this new budding version of Spencer while he's still at home with me. I'm sure next year will be even harder to find traces of these earlier Spencers. This year we forwent the traditional big party with family and friends and opted for a low key celebration. He spent the morning fishing with Daddy and the afternoon he invited a friend over for his very first sleepover. They played in the pool, soaked Daddy in an unfair water gun fight, busted open a pinata, got soaked all over again in a water balloon fight, and played the day away. At night, after the cupcakes and presents and festivities ended, we set up beds on his bedroom floor, hauled in a TV and DVD player, popped popcorn and closed the door, holding our breaths for a quiet, peaceful end to the loud, rambunctious day. That lasted all of 30 minutes, or until the popcorn was gone, before they were up jumping and screaming and wreaking havoc. Eventually, Ashton--the instigator--was banished to his own bedroom, and the two remaining boys settled into a night of whispers and quiet play. At 11:00 we found Jackson fast asleep on the floor, but the birthday boy was awake watching the movie with tired eyes. Apparently, he wasn't in a hurry to end his big day. I don't blame you, Buddy, I love birthdays, too! 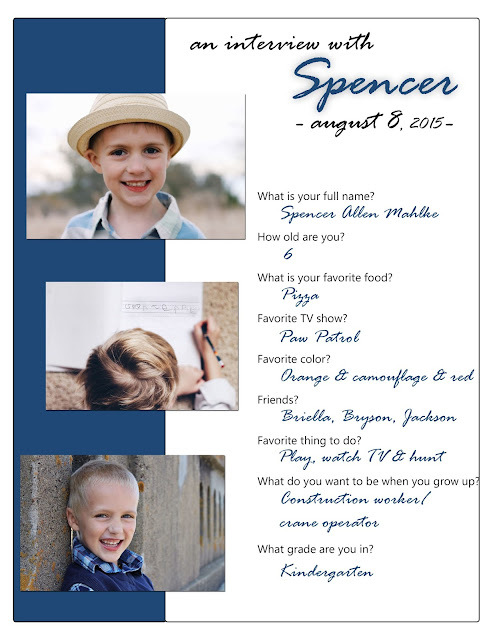 A Tradition of Growth: Spencer's birthday interview. Recently, in preparation for this new arrival due in the fall, we did some bedroom rearranging. Spencer made the big move downstairs. He got to pick out the paint color and he came with to the fabric store to pick the pieces for his quilt. We painted canvases for new wall art and scavenged the house for furniture replacements. The first few nights in his new room, he unrolled his sleeping bag, blasted his new clock radio and camped out on the floor. The transition was a little scarier than he had anticipated, but by the third night, he was sleeping in his new full-sized bed, the sleeping bag forgotten on the floor. His biggest regret about the new room is that he cannot see the garbage truck on Tuesday afternoons from his window anymore. I'm fairly certain teenager Spencer will be just fine with that trade-off. On his door is recycled police tape from a previous spy birthday party and his initials from our alphabet learning series. We added a chalk wall that is only half complete. We still need to add some clips to convert it into an easel as well. The desk was a hand-me-down from Grandma Amy's teaching days, one I used for years. It is now filled with various knick-knacks he's accumulated and numerous workbooks, coloring books and other art supplies. The desk is rarely neat and organized. It's filled with lots of monsters made from notebook paper stapled together with stickers for eyes. Lately, he's been known to staple sheets together with random letters scrawled on each page--an alphabet learning book for his brother, he says. The bed was Dave's as a boy, one his great grandpa hand-crafted, and had been used as our guest bed for years. Spencer traded in his teeny toddler bed for this full-sized one. While debating the wall color, Spencer begged for orange. We conceded with orange bedding and army green walls instead. He came up with the camouflage theme and, although I cringed at the fabric store over his mismatched selections, he boasts about the end result. I'm fairly certain this bigger bed is my favorite part of the whole room. Now I can cuddle up with him at bedtime much more comfortably. And the boys love to use it as their new trampoline. The wall art is One-of-a-Kind Spencer Mahlkes. The dresser was a hand-me-down from Dave's grandparents. It housed bathroom towels in our first house, then my fabric collection in what used to be my craft room (now Spencer's bedroom), and now Spencer's undies and jammies. His closet is the biggest in the whole house. He doesn't even own enough clothes or junk to fill it. The bookshelf came from my old work place and once contained our miscellaneous book collection. Now it has momentos from our recent trip to South Carolina--ocean sand, seashells and ginormous pine cones from Grandpa Dave's yard--puzzles and loads of books we've read far too many times in his six years on this earth. The camouflage chair is a birthday gift from Grandma Amy. The toy box was also hand-crafted from Dave's great grandpa. I love that his bedroom contains a mismatched ensemble of so many sentimental familiar pieces passed on down the line and things he's accumulated over the years. The room will transform many times before he moves on, but I love the way it resembles the boy he is at this very moment.